So, you've taken a look at the big-picture attack plan, identified all your student loans by checking your credit report, and made a spreadsheet of all of their info. What's next? Well, if your interest rate is good and you can make your monthly payment, you just pay them down. If not? You might need some more ammo in your fight against the student loans. Two popular weapons are consolidation and refinancing, and depending on your situation, they might help you out, or set you back. The only way to find out is to look at your individual situation and run some numbers, with the help of a internet calculator like unbury.us. Consolidation just means "combining". 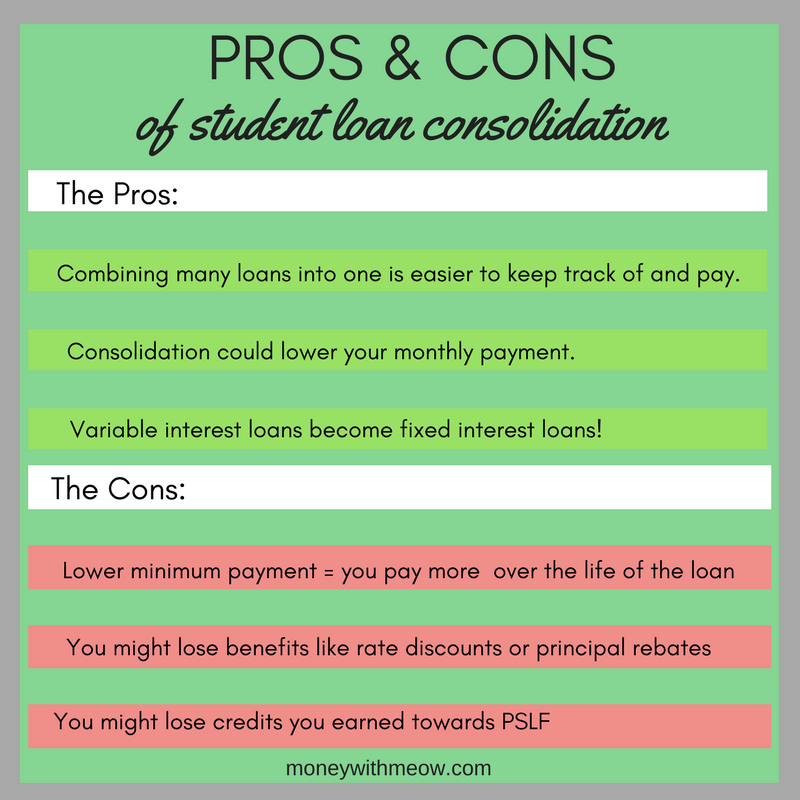 To consolidate, you take out one big loan, and use it to pay off a bunch of little loans all at once. Then you pay down the big loan over time. Careful! You might be approached by companies who want to help you apply for a direct consolidation loan - for a fee. THERE IS NO APPLICATION FEE TO CONSOLIDATE YOUR FEDERAL EDUCATION LOANS into a direct consolidation loan! These 'helpers' are really scammers. The federal consolidation process is easy and free. I have a few federal loans that I can consolidate. But should I consolidate? It depends. Here are the pros and cons. Not everyone will be affected by all of these, however. If you have different loans with different servicers, consolidation cuts the confusion and gives you a single loan with just one monthly bill. Variable-interest loans can be switched to fixed-interest loans. The enemy you know is better than the enemy you don't! Like I mentioned above, a lower minimum payment means you'll pay more in interest over the life of the loan. Think of it this way: Would you rather make 5 payments of $10/month, or 11 payments of $5/month? The lower monthly payment is not the cheapest option overall. But this con is easy to sidestep if you have the income: just because the minimum payment is lowered doesn't mean you have to pay the minimum. 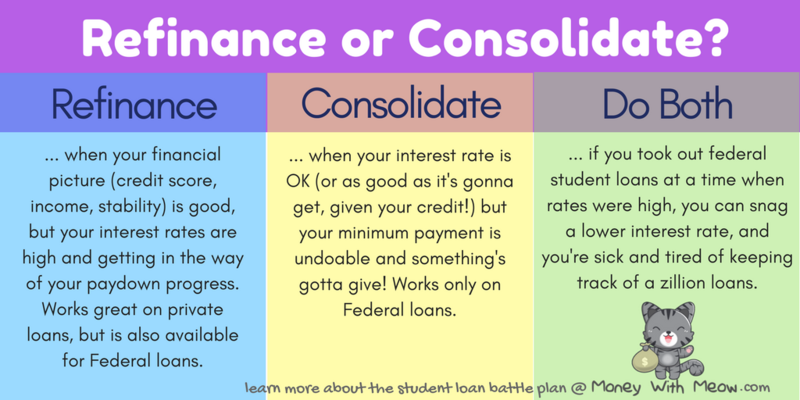 If you consolidate not because you're having trouble paying the minimum, but because you're sick of keeping track of a zillion loans, and your total minimum payment is lowered from $400 to $300, keep putting in $400. Every extra dollar you throw at the loan will save you way more than a dollar in the long run. Some borrower benefits, like interest rate discounts, principal rebates, or cancellation benefits, might get lost if you consolidate. If you’re paying your loans under an income-driven repayment plan, or if you’ve made payments toward Public Service Loan Forgiveness, consolidating will cause you to lose credit for any payments made toward income-driven repayment plan forgiveness or Public Service Loan Forgiveness. Let's say your monthly payment is undoable, but you're one of the people who would be affected by Cons #2 and 3- you don't want to lose out on your benefits. Consider alternatives to consolidation like forbearance or deferment (articles on forbearance and deferment to come.). Once you go consolidated, you can never go back. Remember: when you consolidate, you are taking a new loan, which pays off your old ones. The old loans, with their terms, their interest rates, their downfalls, and their benefits, no longer exist. There is no going back. A Direct Consolidation Loan has a fixed interest rate for the life of the loan. The fixed rate is the weighted average of the interest rates on the loans being consolidated, rounded up to the nearest one-eighth of one percent. So you're not going to get ahead on the interest rate, but you're not going to get too far behind on it, either. Only federal student loans are eligible for federal consolidation. Anyone who claims to consolidate your private student loans is actually offering to refinance them. This works pretty similarly to consolidation, though- refinancing and consolidation are sort of cousins. All refinancing is, is replacing one loan with another. 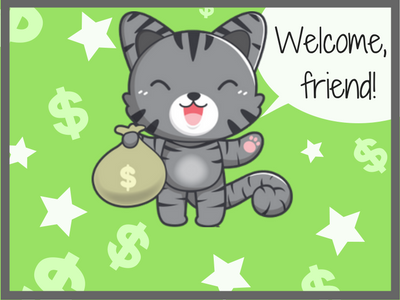 Hopefully the new loan has friendlier terms or a better interest rate- otherwise it makes no sense to refinance! What is the difference between refinancing and consolidating? 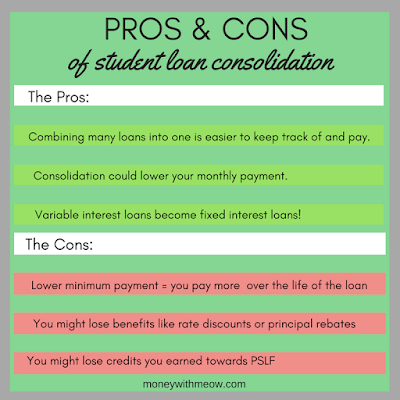 With consolidation, because the interest rate is not reduced, federal student loan consolidation is generally not a money-saving strategy. It saves you money in the short term, but you make up for it (and then some) in the long run. On the other hand, if you have good credit, refinancing might lower your interest rate. That will actually will save you money in the long run, all else being equal. If you do not have good credit, you may not be able to refinance at all. If your credit is bad, chill out and work on rebuilding it. Rebuild by paying your existing debts on time, and by paying a small balance on a credit card in full every month (here's how to use credit cards correctly). Never pay money to build credit! Should I refinance or consolidate? Refinance when: Your financial picture (credit score, income, stability) is good, but your interest rates are high and getting in the way of your paydown progress. Works great on private loans, but is also available for Federal loans. 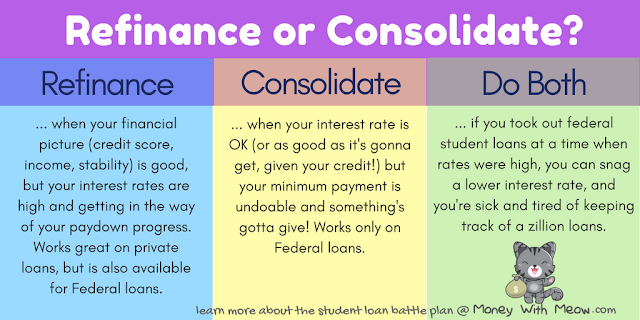 Consolidate when: Your interest rate is OK (or as good as it's gonna get, given your credit!) but your minimum payment is undoable and something's gotta give! Works only on Federal loans. Do Both When: You took out federal student loans at a time when rates were high, your credit score is good, and you're sick and tired of keeping track of a zillion loans. Total Amount Paid: Broken down into principal and interest. Head on over to http://unbury.us if you're not into calculators and spreadsheets. By running these numbers you will be able to make an informed decision. Next up in the Student Loan Attack Plan series: Different Repayment Plans. Stay tuned! And please remember to sign up for my monthly newsletter!